Good Friday is just too full of surprises these days. From Nobita Aquino performing the penitensya to a political penitensya that happened last Good Friday of 2015 now we have yet another marvelous sight. 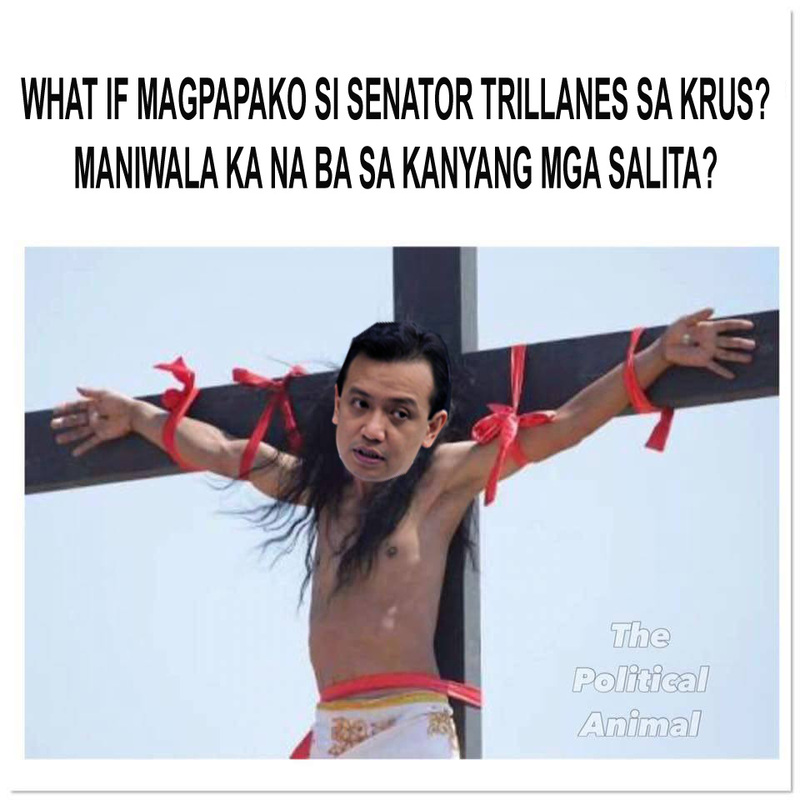 Senator Antonio Trollanes IV after losing his relevancy volunteered to be nailed to a cross. The sight was indeed amazing as Senator Trollanes showed he had a very high tolerance to pain as he didn't cringe while he was nailed to a cross. "Well Mar already crucified himself last two years to gain national attention. Former president Nobita also did the penitensya then so will I. I hope that this sacrifice of mine will restore democracy to the nation. I hope that this act will also prove Leila Dilemma innocent and that President Duterte is a murderer." said Senator Trollanes prior to getting nailed to a cross. Those who volunteered to nail him were Nobita and Mar Roxas. The event was considered to be an ultimate state of epal. This called the attention of former No Direction band member Senator Panfilo Lacson. Senator Alan Cayetano and Senator Richard Gordon. Senator Cayetano lamented, "Too bad we did not install the electric cables. After all, Trollanes is always electrified and he can provide electricity for the whole nation." Senator Gordon said, "It's another act of epal from an epal senator. The fact he showed no signs of pain while he was crucified proves that he really fears nothing because he knows nothing." After the ritual was finished, Senator Trollanes was seen fighting with the staff of the Patrick Star Hospital who said he needed immediate attention. The staff had to sedate the senator so he could be given immediate treatment for his wounds. It was discovered that the nails weren't disinfected and Senator Trollanes may have contacted some germs along the way. Doctors from the Patrick Star hospital will give an update on how serious Trollanes' infection could be.